I attempted this shot back in June but got clouded in. But at 1:18 AM Tuesday morning, SpaceX and the weather delivered! This is the SpaceX Merah Putih Mission launching from Cape Canaveral’s SLC-40, shot from St. Petersburg, FL (about 137 miles away). This is the second flight for this particular Falcon 9 Block 5 rocket, which is also the first Block 5 they have flown. 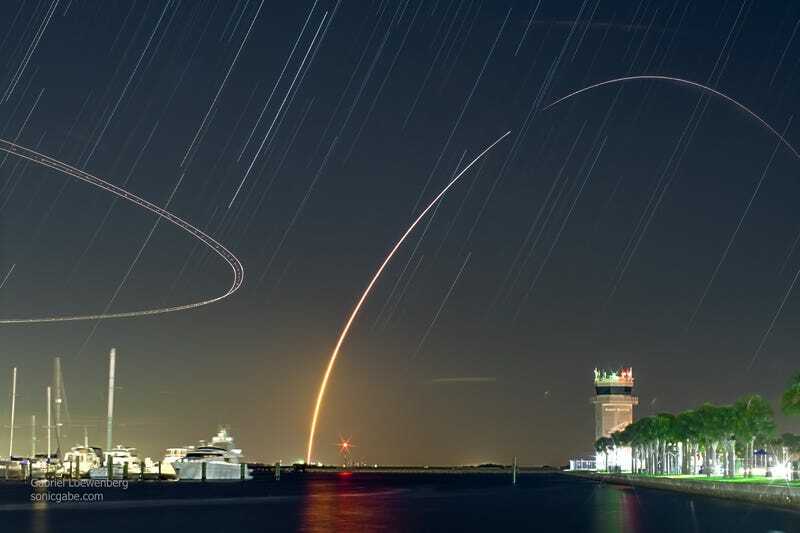 That’s the air traffic control tower for St. Pete’s Albert Whitted Airport that the rocket trail is arcing over. Unlike last time I tried this shot, most of lights in the marina and around the tower were off. This made for a much better picture. The light of the park on the right were still blazing, but that worked out pretty well. This picture consists of 59 consecutive 30-second exposures (29.5 minutes total) stacked in Sequator and then edited in Photoshop and Lightroom. I took this with my Nikon D5200 at ISO 400 using my 1963 Nikkor 50mm f/1.4 lens at f/2.8. If you look around the picture, there are lens flares and light streaks from lights at Albert Whitted Park. When I got set up, I took a test shot to make sure the focus was set right on the lens. It should have been a fairly unremarkable shot. Due to all of the fancy, bright street lights lining Bayshore Drive, I picked up some seriously crazy lens flares. Also, this shot is a great example of how amazingly crisp this lens is. You can practically see into people’s condos... oops. That building on the left is just about 10 or 15 feet short of 0.4 miles away. That’s all I’ve got for now. Sorry for being on a crazy rocket trip recently, but there are plenty of them to shoot right now. In fact, I should be going back to intercostal swamp all Friday night until about sunrise for a rocket launch, hours of star trails, and hopefully meteors from the Perseid shower.